The murder of so many innocents at a mosque in New Zealand, as expected, has brought forth the words of many who try to explain why. Like so many similar instances of wanton killing, there is no single answer. An abused child. A rejected adult. A radicalized follower of a hate-filled group. And so on. In this case, one finds the Internet implicated as the means by which the killer found a community that agreed with and promoted his twisted ideas. Reinforcement of the rightness of your intentions can open the doors of action. Ironically, that same technology that can connect a network of like-minded individuals for whatever purposes, and can separate them from the world. The Internet allows its users to create a community of sameness, in the midst of the real world of diversity and change. Clubs and cliques have served the same function for millennia, but lack the same reach of the Internet. As the ties among the group build, the rest of the world becomes the Other, a categorical thing, possessed of some essential set of traits, inferior and, often, threatening. Once this begins to happen, moral and ethical standards fade away because the Other has been transformed from a human being to something less and different. The anonymity of the Web protects the members of the group, who might hold some concerns, just as the masks of the KKK did for its members. This aspect of the Internet and the so-called social media are like magnets drawing the user out of the living world into a stereotypical universe – stereotypical because the meaning-giving context has been stripped away. The miracle that life is vanishes, as does every moral stricture about preserving and caring for it. The connections made via the Internet are categorically different from those we make face-to-face. A friend on Facebook is not the same as a living, breathing friend in whatever milieu they exist. One big, critical difference is that real-life friends can take care of you in ways Facebook friends are unable to. The reciprocal relation also is there; you can care for the other (small “o”). There is a reason these two modes of interaction are so different. Your brain is engaged in distinct ways. When you are on the Internet, your left brain hemisphere is largely in charge. Invisibly or not, you are following the rules that go with the program in front of you. That’s the way the left side works – acting on the basis of rules and abstractions that have been explicated from experience and stored in memory. In more intimate situations, the right-hemisphere is the master, capturing the scene as it is, not as some abstract version, and inventing whatever actions fit the moment. Interactions with others can be empathetic, reflecting the actor’s sense of what is going on over there. Care and love are actions rooted in the right-side of the brain. Information technology, by its inherent nature, removes context from the outputs that we, the users, react to. Other forms of technology also produce the same stripping of context, but not as starkly. When you see someone using a cane, you can guess that they have some sort of physical impairment. But the use of a smartphone tells you nothing about the person. The murders in New Zealand are the extreme result of the closing-in potential of the Internet. Bullying, another example of Othering, has led to suicides. Sherry Turkle, an MIT researcher who studies technology and its societal impacts, points to other ways mobile devices produce alienating effects. The ability to converse, face-to-face, is diminished among young users. 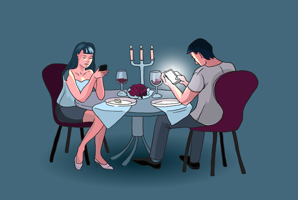 Scenes of families at the table with each one using a smartphone, ignoring the others, are all to familiar in real life and cartoons. The giant purveyors of the devices and media have a responsibility to, at least, face up to the potential harm created by this technology. While the connection to harm may not be as tight as that of, say, pharmaceutical companies, it is still there. We do not tolerate dangerous drugs and hold their makers responsible. Should we show the same concern for the device and media companies? I think so.